Although low-fat diets were the trend for years, you can actually eat some fats and still lose weight and be healthy. In fact, eating the right types of fat in moderation can actually be good for you and help lower your total cholesterol. Find out which fats to include in your diet and which ones to avoid. Saturated fat: Animal products like dairy and dairy products, eggs, poultry, meat, and seafood; palm and other tropical oils. Trans fat: Partially hydrogenated vegetable oils, fried foods, commercial baked goods, margarine, and shortening. While the Nutrition Facts labels on your foods will list saturated fat contents, you should also check the ingredient list to make sure none of these items are used. Monounsaturated fat: Olive oil, canola oil, avocados, peanut oil, and nuts and seeds. Polyunsaturated fat: Nuts, seeds, and vegetable oils. 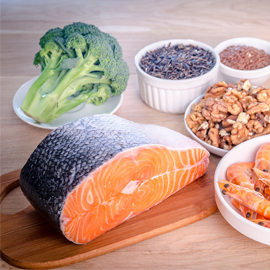 Omega-3 fatty acids: Fatty, cold-water fish like herring and salmon; flaxseeds, flax seed oil, and walnuts.